I never did share what my goals for this new year are. Something about saying it out loud, or putting it in writing, makes me think that my goals will be jinxed! Anyway, one of my goals is to take as many areas of our spending as possible, and investigate ways to save and still enjoy the same quality of our life. That doesn't mean that I will actually cut spending for every line item, but that I will look into cutting the cost and see if there are ways to do so, but keep our life enjoyable. Some areas of our budget may actually see an increase in spending, as I balance spending with enjoyment. This past week, I found another item to spend "better". If you've been reading my grocery journals closely, you know that I've been buying onion powder, from the bulk spice section of Fred Meyer, since last winter. Onion powder (at the least the stuff that I buy) is only made of onions, no additives. I like the flavor boost that it gives to dressings, dips, sauces, soups and gravies. 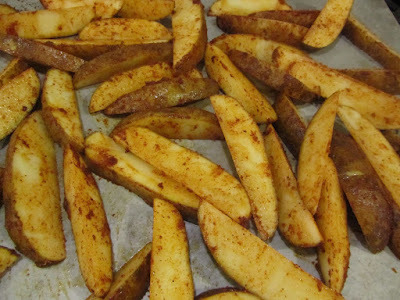 Add to other spices and seasonings, it's part of a delicious seasoning sprinkle for oven-roasted potatoes or otherwise plain meat, similar to Lawry's Seasoning salt, just considerably less salt. I went back through my grocery journals and found that since March 2015, I had bought about 8 oz of bulk onion powder, and spent about $3.75, in small amounts each time, at a price of $7.19 per pound. I told myself that I would check Cash & Carry's price on canisters of onion powder, as it was clear that I could go through a full canister in a little over a year. 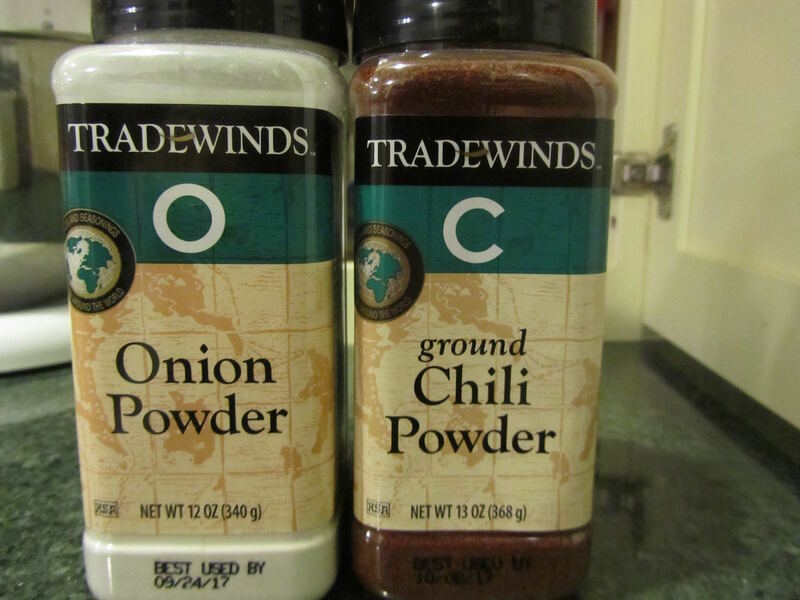 And last week, onion powder did go on sale at Cash & Carry, for $3.25 for a 12-oz canister, that's $4.33 per pound. That's a savings of about 40% per pound, by buying onion powder in a canister at Cash & Carry, over buying in the bulk spices section of Fred Meyer. And I've proven to myself that I will go through this larger amount in a reasonable time. Just another item in my budget where I've found a way to cut our spending, but keep the same quality of enjoyment. Maintaining our satisfaction with life is an important aspect to us, within our frugal living choices. This isn't anything newsworthy, buying something in a large package, to save on unit cost. But revisiting all of our spending, has paid off for us, time and time again. Other items that I've found a less expensive venue for purchase this month include: full spectrum light tubes for our grow light operation (bought through Amazon instead of the place where I had bought the entire set-up, saving $9 per tube, when bought in a 5-pack, as opposed to buying 2 tubes at a time -- I have 3 spares, now, and 2 will last me about 3-4 years), buying a specific book as a gift for a friend, again through Amazon, instead of the shop where I originally saw the book (saving $8 on the book), buying a large bottle of lavender essential oil, instead of the 10 mL that I usually buy at a time, (saving so much per ounce that I kept thinking I must be doing the math incorrectly, it's literally a fraction of the cost per ounce to buy in a larger size). In addition, I'm doing things differently, not just shopping differently, to save a bit of money. I recently went into the city to visit with a friend. I chose to take the commuter bus, instead of drive and park downtown. Parking downtown is very pricey in Seattle. My bus ticket, round trip was $7. If I had driven, I would have spent a minimum of about $4 in gas, and $8 in curb parking for 2 hours, or $12 total. In one instance, I got exactly what I wanted, just with a bit of a time delay. In two other instances, I got a surplus, to keep on hand for future use. And in the fourth instance, I got a more favorable experience -- I didn't have to drive in traffic, actually find street parking, or watch the time to make sure I didn't go over my paid limit of time. So, I'd say, it's been a win! See, this is exactly why I like your blog so much! We think so much alike in this respect. Yes, I use lots of onion powder and buy it in bulk, lol, but what I mean is investigating all sorts of "little things" where small savings add up over time. This week, for me, it has been pet food. I had been "slacking" and sometimes buying smaller cans of cat food (to be fair, sometimes the store is out of the larger size). After finding the best food for the price, which we've been using for some years now, the next step is naturally to buy it in the most cost-effective size. Instead of feeding 4 5 oz cans per day, for less money I can feed 2 large 13 oz cans for day, saving $11.40 a month over buying all small cans (though realistically I had been using part large, part small). And TSC (at least here) offers a 5% discount when purchasing 10 cases at a time. Well, we use about 9 cases per month between cat and dog food, so the next natural progression is to start buying 10 cases every time which saves an additional $6.47 per 10 cases purchased. All this adds up over time. Just one of many little things I am trying to work out in order to save more monthly and yearly. The other thing about buying 10 cases at a time, for you, is that you won't have to think about it as often. That's a bonus that I especially appreciate, with buying in large quantities. "Maintaining our satisfaction with life is an important aspect to us, within our frugal living choices." Finding ways to cut expenses without feeling deprived, and in your case getting the same thing or more, for less, is the way to do it! It's such a feeling of satisfaction, to find the same basic item, but save a lot of money in the process! You have some great examples of saving money and being happier with your frugal choices. I especially like your example of using the commuter bus--I wish I had that option here! Oh yes, oven fries. I'm busy turning all of our potatoes into mashed for the freezer, and I will mis having whole ones to oven-roast! Seattle does have a pretty decent bus system. And the commuter buses are nice enough, nothing luxurious, but decent and clean. And the fact that I didn't have to do the driving was a real bonus. Perhaps when you reach the point of no "new" savings, and you're continuing on, using all of the "old" savings techniques you've found, that you will be at your perfect level of frugal living, enough savings to live comfortably, but not risk outspending your retirement funds. I totally love all of your little calculations. I mean if you can significantly cut expenses for even 20% of what you buy, it adds up to a non-trivial savings over the course of the year. I'm thinking of the giant 25lb block of soap that I bought a few years back. Some folks thought I was nuts, but I saved over 75% buying it that way, and now I don't have to worry about soap for years! Where did you find a 25-lb block of soap? Do you cut off chunks as you need them, or did you cut it up when you bought it? I'm guessing that not only did you save money, but you were able to buy a higher quality product, or support a local craftsperson. I use onion powder, in addition to using fresh onions, in the same dish, such as soups. It boosts the flavor, without adding salt. Well, at least you know that you won't need to hunt down deals on cat food for a long while! I bought it on Amazon - it's actually plain unscented glycerin soap, designed as a melt & pour base for folks who are making fancy scented soaps or something like that. But since I like my soap unadulterated, I just cut it up into bars, wrapped them in paper and... well... I think It's gonna last me a good long time. 25 pounds was a slightly bigger block than I had imagined. Pictures here if you want to see what 25 pounds of soap looks like! Oh, Cat! That's funny! not the buying so much soap, but your reaction to it arriving. I've done that, too. The what was I thinking moment! The really great thing, though, is you don't have to even think about buying soap for a long time. I have enough to think about every day, I certainly don't want to clutter my brain with thoughts of being almost out of soap!. Or anything. It will never happen, but I dream of having enough of everything that I could go a month without once having to think that I am almost out of something. I love that with laundry detergent, flour, butter, milk. Yesterday, I was getting another pound of butter out, and I stopped to count the pounds left. I haven't had to count butter in a year, now. Anyway, i counted 12 pounds. that sounds like a lot to a single person, I'm sure. But for us, it took over my mind, thinking I needed to figure how long it will last, at what price I might be forced to buy more, etc. FYI, when I took this pound out, I marked on the wrapper when I opened it. I'm curious to see if a pound lasts us 10 days, that would give us 4 months of butter in stock. I think that it's smart that you just didn't buy the onion powder in a larger amount because it was cheaper. You knew that you could use that much in a timely manner. That is an important part of buying in bulk--making sure that you can use and have room to store the large amount you get. And I'm with Kris. I was distracted by the oven fries. However, we won't be having any of those tonight. I used the potatoes up last night with roasted potatoes. Those were good too. However, I never met a potato I didn't like, so I could have them every night. When I first bought a small amount I wasn't sure I would use it vey often. But now, several months later, I find myself reaching for it often enough that I believe I will go through this canister in about 4 or 5 months. You're right, it would be ridiculous to buy a huge amount of something of which you only use a small amount. I've been thinking about this all day. I just ran out of a big canister of dried onions but it took a few years to use them. I'm not sure if I should buy another container or not. I use them when I don't feel like dicing an onion or soup or something. I also have lots of spices and I hope they don't go back before I use them. Things like chili powder, turmeric, cumin, cream of tartar, curry powder, cinnamon. I use garlic powder a lot and onion powder just a bit. So, I have as my goal to work through some of the spices and reduce the ones I rarely use. As for the cost savings (or not), I won't have to buy any for a while! You can keep spices in the freezer, to prolong their life. When I've bought chili powder and cinnamon in the super large containers, I pour out a small bottle-full to keep in the cupboard, but keep the rest frozen. I place a piece of plastic wrap over the opening on the big container, then screw the lid on tight. It doesn't pick up freezer odors, and stays fresh and flavorful. Cream of tartar seems to keep indefinitely in my kitchen. I have a small bottle, given to me by a sister-in-law almost 15 years ago, and it still works. I save it for using in cookies like Snickerdoodles. Many of the other spices you mentioned contain minute amounts of oils, which can turn and affect flavor or the flavor can dissipate with age. I've kept ground spices in the cupboard for over a year without any problems, other than perhaps not being as flavorful as when first purchased. That is good to know that cream of tarter keeps so long, I bought a canister over a year ago to make snickerdoodles & never made them! I have been wondering if it would still work. Thanks! if kept dry,and at normal room temp, cream of tartar should keep indefinitely, according to the experts. Isn't that great?! As it's used in just a handful of recipes, it's nice that it keeps so well!